Awarded the Dispelling the Myth Award in 2009, P.S. 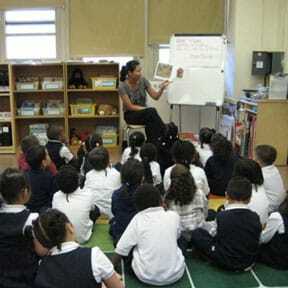 83 Luis Rivera Elementary School continues to outperform much wealthier schools in New York City and state. The teachers, in turn, credited Castillo. “The principal is the glue,” said one. “We are not too proud to say we’re having trouble,” said another. “We all bounce ideas off each other. Early on, Castillo and her assistant principal, Hazel Cruz, established an instructional cabinet, made up of grade-level chairs, which meets once a month and makes many of the decisions for the school. The cabinet has a hiring committee to help with hiring decisions and an inquiry committee that grapples with the question of how the school can be improved. This means that the more-or-less constant state of flux that all schools are in is managed within a structure of constant communication and consultations. And over the years there have been many changes, beginning by throwing out the old basal readers and replacing them with “print-rich” classrooms with hundreds of books each; incorporation of careful phonics and phonemic awareness instruction; adoption of a positive behavioral support program and a character education program; applying for a school-based medical clinic through Mount Sinai; participating in the city’s elementary school ballroom dancing program; and much more. The faculty engage in continual reflection on their practice, reflection that is not only encouraged but scheduled. For example, every year Castillo and Cruz lead three walkthroughs of the building looking for patterns: Are students engaged in instruction? Are the classrooms organized to support instruction? Is there evidence that teachers are planning what they are teaching and then teaching it? Do the teachers have evidence of what their students are learning? In addition, teachers are scheduled to visit another colleague’s classroom every month and are expected to report what they learned and what they will try in their classroom. All of this makes for a vibrant professional community. As an example, not only is student work posted in the hallways but teachers’ work, from book studies and other professional development, is also posted — a visible reminder to students and the community that schools are places where everyone is learning.